The National Academy of Engineering (NAE) has added Dean Roemmich, a distinguished professor of oceanography at Scripps Institution of Oceanography at the University of California San Diego, as a member, making him one of 83 newly elected American scientists in its class of 2018. Roemmich is being recognized by the NAE “for breakthroughs in ocean observations that have advanced the understanding of Earth’s climate system.” He has most notably been associated with the leadership of the global Argo network, an array of robotic floats that provide for the first time in history a comprehensive view of the “vital signs” — circulation, temperature, salinity, and density — of the upper oceans. “I’m honored to be selected for NAE membership and especially to have the transformational contributions to ocean science made by the multinational Argo Program recognized in this way,” said Roemmich, a professor in the Integrative Oceanography Division and the Climate, Atmospheric Science, and Physical Oceanography Division at Scripps. Roemmich is a leading expert in the general circulation of the oceans and the role of the ocean in the climate system. He helped conceive, then led and developed international scientific support for Argo, which covers the world’s oceans from the sea surface to a depth of 2,000 meters (6,600 feet). In 2014, the program began developing and deploying Deep Argo floats which can make profiles from the ocean surface to the ocean bottom, reaching depths of up to 6,000 meters (almost 20,000 feet). There are currently 69 Deep Argo units deployed globally, 38 of which are operated by Scripps. More than 30 nations and hundreds of researchers currently participate and cooperate with the Argo Program, which has been called one of the scientific triumphs of oceanography. The data collected by these probes and made freely available have transformed society’s understanding of the ocean’s roles in climate variability and change over a broad range of space- and time-scales. Argo data now appear in about 400 research papers per year. Roemmich has served as co-chairman of the International Argo Steering Team since its inception, and coordinator of the U.S. Argo Program. He led the original international design team of the Argo array in 1998. Prior to Argo, Roemmich was already a pioneering oceanographer whose studies covered the large-scale circulation of the oceans by combining hydrology and satellite altimetry. These studies, which examined the heat budget of the ocean and required the design and implementation of new observing networks, set the stage for the work currently being done by the Argo Program. 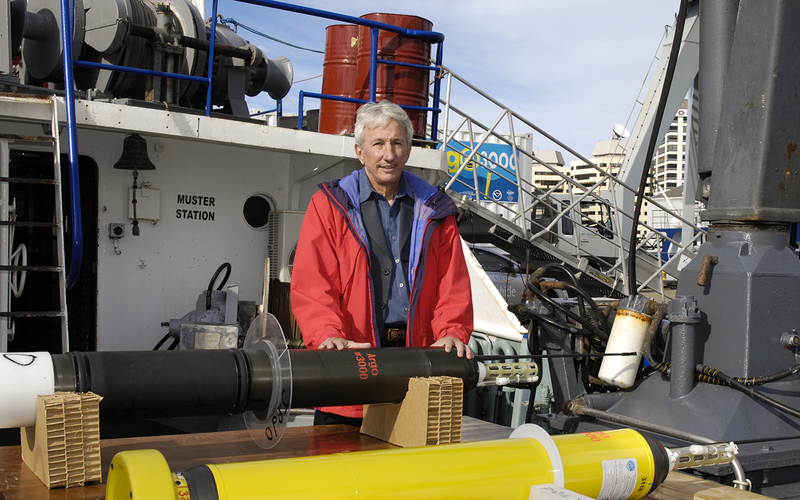 Roemmich’s role in the development and implementation of the Argo array, as well as earlier research achievements, were recognized by his receiving the American Meteorological Society’s Sverdrup Gold Medal in 2008, and being selected for the National Academy of Science’s Alexander Agassiz Medal earlier this year. In 2010, Roemmich was named a Fellow of the American Geophysical Union. He also served as a lead author for the 5th Assessment Report of the Intergovernmental Panel on Climate Change (IPCC). Roemmich has published more than 90 research papers over the course of his more than 35 years as a researcher and educator. Roemmich joins Scripps researchers John Orcutt and William Kuperman as active members of the Academy. Deceased Scripps scientists who had been members include William Nierenberg, John Isaacs, and Fred Spiess.